A PR campaign launched to promote a new game from Ubisoft has highlighted the holes that many people leave in their Facebook privacy settings. You can take this inadvertent security test to get an idea of what stalkers and identity thieves might be able to learn about you from your Facebook profile and activity. If the results are unsettling, I have some tips for you on tightening up your privacy settings. Read on! How Secure Are Your Facebook Privacy Settings? Do you know the impact that your friends and Facebook apps can have on your privacy? Go to Digital Shadow and click the “log in with Facebook” link. Don’t let the sinister special effects on the site scare you; it’s just part of the mood-setting for the game. Clicking the link will allow the site to pull public information from your Facebook pages and compile a dossier on you. You’ll learn how vulnerable you are to facial recognition; how closely Facebook can estimate your physical location; which friends you interact with the most; which “friends” are of little significance to you; when you are most active on Facebook; and more about your Facebook activities and relationships. The Digital Shadow app describes how this data can be used to infiltrate your real-world and online lives. Friends can be vulnerabilities; the more familiar a person is to you, the easier it is to get you to accept an imposter as the real McCoy and persuade you to click on a link to malware, or give the bogus friend sensitive personal information. It’s even easier to impersonate someone with whom you don’t interact very often. Knowing when you are most active on Facebook tells a hacker when you are connected to the Internet, and that’s when it’s possible to probe your device’s security. To review and perhaps tighten up your privacy settings, click on the icon shaped like a closed lock in the upper-right corner of any Facebook page. (On my screen, it's a dark blue icon on a blue background -- a bit hard to notice unless you're looking for it.) A drop-down menu of “privacy shortcuts” will appear. The Use Activity Log link will show you things you've posted or been tagged in, and who can see them. The View As… option lets you view your Facebook pages as if you were an anonymous member of the general public, not even logged into Facebook. You can also enter the Facebook username of any user to view your pages as that person. After clicking “Who can see my stuff?” you'll see the "View as" link underneath "What do other people see on my timeline?" Another good thing to check is the apps that are connected to your account. When adding an app, they can (and do) ask for permission to view all sorts of personal information, including your friend lists, news feed, relationships, birthday, work history, status updates, education history, groups, hometown, interests, current city, photos, religious and political views, follows and followers, your "likes" and even your friends' status updates and photos. Some apps can even post to your Facebook page. I trust very few Facebook apps, and often remove them after use. (I just did that with the Digital Shadow app.) To see which apps are connected to your Facebook account, and what they are able to view, click this App Settings link. Click Edit to see an app's permissions, or the little "x" to remove the app. It's a good idea to do a spring cleaning on your friend list, too. Do you really know and care about all of those people? 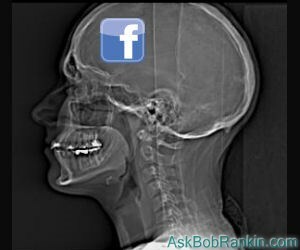 Have you properly limited what those friends can see about you and your Facebook activities? Facebook privacy settings are complicated and confusing (and maybe that's intentional). It pays to view yourself as others can view you from time to time, and to make adjustments to privacy settings, apps and friend lists as necessary. Help, My Browser Got Hijacked! Most recent comments on "Facebook and Your Digital Shadow"
I just tried Digital Shadow. Wouldn't you know it, I live in Belize in Central America, and Digital Shadow wouldn't let me log in. I can't help but wonder why? Excellent article; thanks so much, Bob. I have an issue, also, with unrelated sites, like some news publishers, which force you to sign in by using your Facebook, Twitter, or other social sites' login information in order to post a comment on their articles. This adds to the general lack of security. Well that was fun, little disturbing, as they think my family are stalkers. Goes with a CNN report I watched last night: Morgan Spurlock and Big Data. Thanks for the information. Bob, this is really scary!!! First of all, I didn't even have to "log in" to FB!!! They had most of my information, even though, it wasn't accurate. Must admit, this is a good way, to get your attention, about a game!!! What really scares me ... Are the pictures, that my daughter and grand-daughter share about my great grandson. WAY too much information, is out there, through Facebook!!! In all honesty, IF, I really "batten down the hatches" for privacy reasons ... NO one will be able to see anything or post anything on my Facebook page. So, you "open" things up and BAM ... You lose your privacy!!! Then there is the REAL fact ... FB continually keeps changing the "codes", so, that they are promoting more and more Ads, for revenue!!! Somewhere, all of us Signed Up for Facebook and somewhere in the EULA, we actually "gave up our freedom", so, that we could use FB, at NO charge. Now, that is the real truth, that no one really wants to face. Basically, we "sold our souls" to Facebook, because it doesn't cost us, a single cent to use it. Very interesting, they couldn't identify me in photos, determine my location or come up with anything close to my password. I seem to be doing something right. If what "they" tell me is true. Maybe a false sense of security?! - it simply displays "You can manage the privacy of things you share by using the audience selector right where you post. This control remembers your selection so future posts will be shared with the same audience unless you change it. ", and it has a drop-down selector button for choosing who can see future posts. -no mention of "View as"... and I was excited to use this feature. I keep a Facebook account, but I keep it locked down as tight as I can. In general, I HATE Facebook. I'd delete the account if I didn't need it occasionally to access something. Tried the Digital Shadow app just to see what would happen. Pretty good privacy level, although it did come pretty close on income, age, and educational level. But mostly, it had insufficient information. Glad to see my preferences have held true. Am I doing something wrong? I clicked on sign me in and put in my info. It them said it was infiltrating and then would like to post to Facebook for me skip or OK. I pressed skip and it said the infiltrating thing again and nothing happened except the graphics kept repeating itself? If I clicked sign in again it would go back to the same page, skip or ok? What is it supposed to do? Hi Bob, just like many others I can't go there as it says: either I'm too young (I would love to have those years back again) ;-) or because I'm in Italy!! Also clicking the link on the main page opened another 4 windows!! I am not allowed to log in. I have platform apps turned off and plan to leave them off. I got that message too, about not being able to log in bec of age, country etc. I persisted, highlighted the URL and hit enter and got another page, saying to treat the new URL like it was a password. I just kept at it, until I was in the game. I'm a Canadian too, btw. I stayed away from facebook, twitter and all the social media sites. After reading your article, and all the posts, I am glad that I did. Thanks for the info Bob. Should have done this long ago. Tried, tried, and retried. Nothing but the ongoing graphic. I'm in New York state, and am at least 3x the age of consent. I have a WiFi hotspot, faster than dial up, but not exactly cable fast. Only an idiot would fool with that rubbish (faceyspace) in the first place! Get a life! The first time I went to use a Facebook App, and I saw all the personal info I would be letting them see, I vowed to never "use" an App. And haven't. Consequently, "Digital Shadow" told me I needed to turn "Apps" on. NOT!!! Does that help keep my personal info hidden? I hope so. I enjoy sharing with my Friends on Facebook, only very rarely as "public". I guess I should change my Facebook password now. I don't trust that site. This was fascinating. It says I have a low risk of exposure, but others who interact with me can be mined for information about me. It thinks I am a lot richer than I am! Well, I don't post much on my own--just respond to funny things others post. But what about all those organizations that have Facebook pages for events and everyone is posting, under their real name, that they are going to be attending? These are public pages...isn't that another "please burglarize me" situation? There's more reader feedback... See all 25 comments for this article.